Certain types of snow can ball up in your horse’s hooves, especially if he is shod, making it difficult for him to walk. If you keep your horse barefoot he’ll actually do better in the snow than those with shoes. Chilled muscles take longer to warm up so take it slow and give your horse time to get his footing. 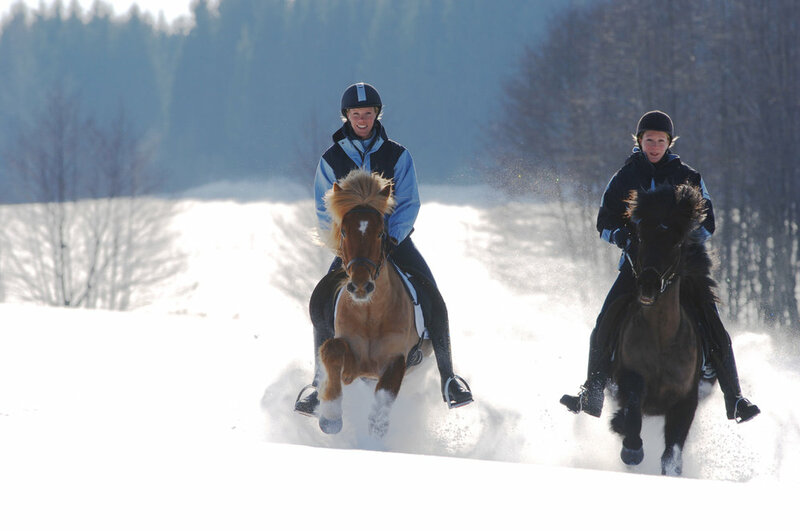 Horses have to work particularly hard when walking through deep snow, so be aware of your horse’s fitness. Some horses also don’t like the sensation of snow flicking up on their bellies. Freshly laid powdery snow is less likely to ball up, but if it’s got sticky or has a layer of frost over the top it can get stuck in your horse’s shoes, and this can make it harder for him to grip the ground. Try not to head out on a route you are unfamiliar with – a blanket of snow can hide a lot of unexpected surprises. Ice and hard frost should be avoided unless your horse is used to such conditions. Be especially wary of riding on roads. Special pads and ice caulks can help your horse grip in slippery conditions. A coating of petroleum jelly or industrial grease on the bottom of his hooves can also help the prevention of snowballs. Depending on the temperature and the work consider using a quarter sheet, particularly if your horse is used to being stabled and rugged. Don’t forget to wear a few extra layers yourself to keep warm. If your yard is concreted make sure you grit or salt it. Spreading some straw or bedding on the walkways will also help. Mr Michael Jung certainly doesn’t let the snow hold him back as seen in this video of him cross-country schooling!